Considering the amount of beautiful scenery here on the South Coast, it's not surprising that we have an active and fun photography club that finds a nearly-endless source of inspiration in this special region. 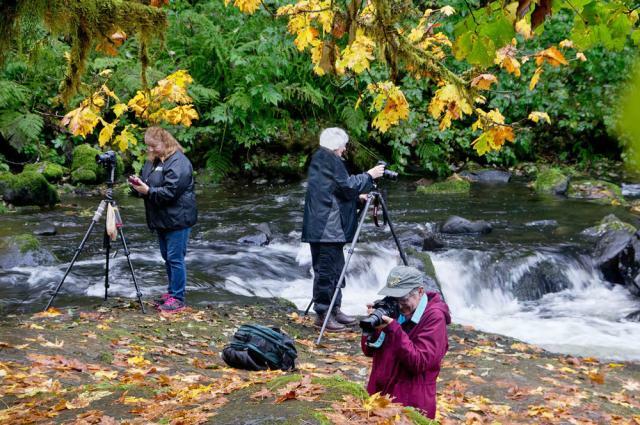 In addition to twice-monthly meetings at the North Bend Senior Activity Center, members of the Oregon Coast Photographers Association hold frequent photo "shoot-outs" at different locations, and take part in lively competitions with other group members and with regional affiliates. Among their highest-profile activities are twice-yearly photography shows in Pony Village Mall, with members offering prized photos for public viewing and potential purchase. The next show is April 25-28. Group members also set up the popular photography exhibit at the annual Coos County Fair in Myrtle Point, with many members entering the various competitions. The photos are judged by experts from outside the area not involved in the competition. Anyone interesting in showing photos or helping out is invited to attend one of the group's meetings on the first and third Mondays of the month. At last week's meeting, Pony Village show organizer Bonnie Smith noted "there's still time to prepare entries." Those showing their work take turns staffing the exhibit during the show, she said. Following an invitation from Carol Todd, editor of the group's newsletter, The Proof Sheet, to submit photos or stories, members shared photos on the meeting's pre-determined theme, which was "green" in recognition of St. Patrick's Day. They also participated in a show and tell, sharing up to five images and discussing technical aspects. On a lighter note, the "Hah Hah" session featured humorous photos, some of which were manipulated with photo editing software. The "4 Ws" session had members sleuth out "who, where, what and when" an Oregon image was taken. Here, too, photo manipulation was okay, especially if it helped disguise the setting by taking out certain key identifying features, such as road signs. Following a break – complete with green-colored cookies -- photos submitted by members and affiliate groups were judged and critiqued, with time to look carefully at each photo and discuss its aspects. "We have a lot of fun," said board member Don Todd. "We're very serious about photography, but we're not serious people." At the meeting, a visitor shared samples of custom-created photo mats of wood and paper made with a laser-aided cutting tool, and offered his services (for a fee) to group members. Another member presented a slide show with accompanying music, noting she enjoyed using the website www.bensound.com to obtain royalty-free tunes appropriate to the subject. Others shared abstract effects created by specific software, such as a Van Gogh-like swirl that turned out to be a close-up of a daisy spun into a blur. Another melded a photo of a sunflower into a "frame" created by one of the cathedral arches of McCullough Bridge. A highlight was a display of photos taken with a medium-format camera, with amazing detail and sharpness not possible with a standard digital or cellphone camera. While members find plenty to photograph here on the coast, they look forward occasional field trips – "shoot-outs" -- such as one planned for this summer in Bend, where they'll explore potential daylight as well as "dark sky" subject material. Here again, experienced photographers will share tips. As noted, anyone interested in photography is welcome at the meetings – and to take part in the upcoming Pony Village show. "We don't care what kind of camera you've got, even cellphone cameras, because they're relevant to what's going on today," said Don. The welcoming atmosphere also "brings us to people who want to get more into photography than just with their cellphones." The meetings and outings are also opportunities for people to expand their camera skills, said Don. "Some people never take their cameras out of the 'auto' setting or even know how to get it into the 'manual' mode, and we're certainly glad to help them out." But despite the seeming-ubiquity of cellphone photographers, group members like Don and others are not going to give up their traditional cameras anytime soon. "I tell my grandkids and other young people to hang onto their real cameras because they'll take them to places they never imagined." The group's next meeting is set for 6:30 p.m. on Monday, March 18 at the North Bend Senior Center in Airport Heights. Find out more at http://www.oregoncoastphotoclub.org.